Czas spędzony na świeżym powietrzu, na beztroskiej zabawie z rówieśnikami, przy użyciu różnorodnych, kolorowych przyrządów stymulujących wyobraźnię i przenoszących dzieci do bajkowego świata... a dodatkowo niewymuszona, dyskretna nauka języka angielskiego! Wyruszamy na plac zabaw, spożytkować niewyczerpane pokłady energii naszych pociech. Let's go up the stairs and then down the slide. Take your friend and play on a seesaw/teeter-totter/teeterboard. 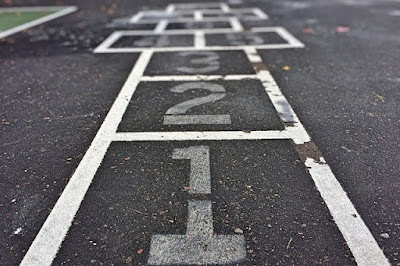 You sit on each end and take turns pushing your feet against the ground to lift your end up in the air. Would you like to swing? Look, the swings are over there. There's a merry-go-round. You can make it spin by pushing or pulling by its handles. Hop on the horse spring. Let's gallop! On a horizontal ladder you can hang or swing like a monkey! Are you strong enough to climb a wall? Climbing the net is a lot of fun! Try to go through the rope tunnel bridge! Let's check if you can pull yourself up on those hanging rings! 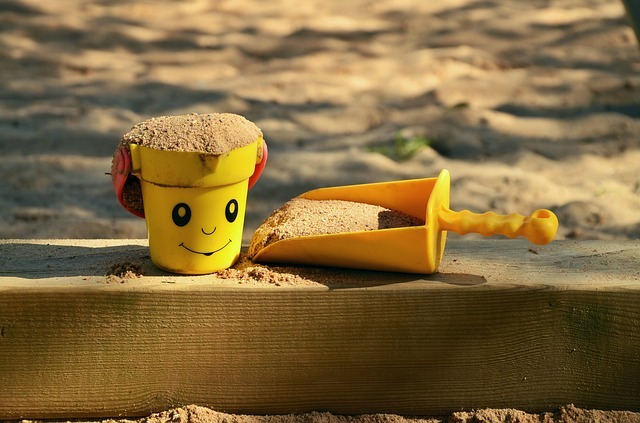 If you want to play in the sandpit (BrE)/sandbox (AmE), you have to take your moulds (BrE)/molds (AmE), a bucket, spade and rake. 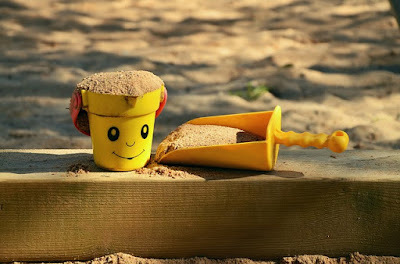 To make a sandcastle: First put damp sand in the bucket, turn the bucket upside down, tap it and lift the bucket up. Let's dig a moat around the castle. Would you like to bury your feet in sand? Scoop up sand with a spade and sift it through a sieve to get rid of all the pebbles. If you don't have a sieve, you can always try to sift sand through your fingers. Let's play with your digger/excavator. Scoop the sand here and dump over there. Look! There's a dump truck. We can load it with sand/dump the sand. Don't throw sand! / Sand stays in the sandpit. 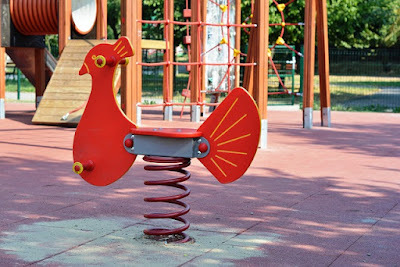 Hop on the platform of a spinner, push off and spin. Do you remember how to play hopscotch? Or should we go over the rules again? You can use the chalk to scribble on the pavement. To play leapfrog, you need to have at least one companion. Grab your helmet and pads. 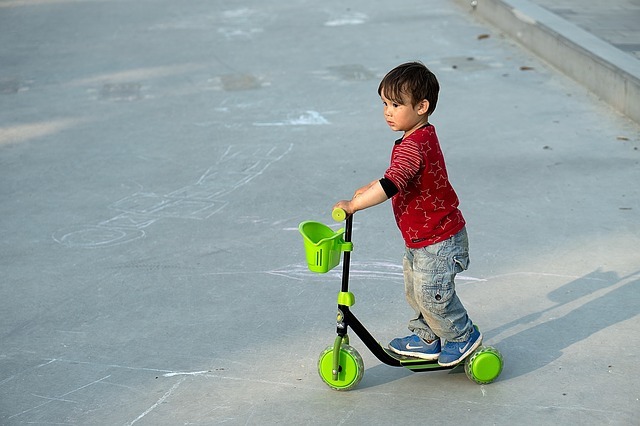 Let's scoot! Hop on! One foot on the deck, the other one on the ground. Let's whiz(z) around the room/town/playground. Off you go/ You go scooting on. Look out! There's a speed bump! Turn left / right with ease. Weave right & left and make in circles. Weaving is important because it will enable you to avoid rocks & other objects.